Most of us are guilty of overindulging in food from time to time – just watch people at buffets or during the traditional Thanksgiving meal for proof. For most of us, the occasional high calorie overindulgence is an infrequent occurrence. For some, it is the hallmark of a serious eating disorder. Binge Eating Disorder (BED) is characterized by recurrent episodes of overeating and feeling out of control when bingeing. Unlike bulimia, those with BED do not practice compensatory behavior such as purging, using laxatives or over-exercising. Binge Eating Disorder is the most common eating disorder in the United States. Men account for 40% of the 8 million Americans thought to have BED. Many binge eaters become overweight or obese due to their overeating. Binge eaters who become obese suffer health consequences ranging from heart disease to diabetes. Some people with BED control their weight by alternating periods of bingeing with dieting. This behavior creates a vicious cycle – the strict dieting leads to more bingeing which leads to more punitive dieting and so on. This yo-yo dieting further strains the body and mind. While bingeing, those with BED often feel a loss of control. Many eat thousands upon thousands of calories in one sitting. Victims of this eating disorder have feelings of guilt, shame, depression, anxiety or anger after bingeing episodes. These negative feelings often lead to more bingeing – creating an overwhelming cycle that is difficult to break without professional help to uncover the emotional components behind BED. Most people with BED eat alone while bingeing and hide evidence of their food consumption from others. Many people have a dismissive attitude and feel those with BED simply lack willpower. Others simply condemn those with BED as having poor judgment regarding food. It’s not that simple; BED is a recognized eating disorder with psychological components and physical complications. Those with BED are keenly aware of how others perceive excessive eating, gluttony or “pigging out” as some people dub bingeing episodes. 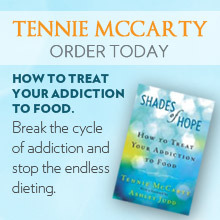 This knowledge leads to feelings of shame and hiding bingeing behavior. Some hide it so well that their loved ones have no idea they have BED. If you feel that you or a loved one might have BED, please call Shades of Hope for a free assessment and confidential consultation.